Situations that need divine intervention. Do you remember how Jesus told us to pray about those issues? He told us to speak to the mountain! So are you ready to do that? Click on the video and let’s get started. To live a transformed life you have to speak to the mountains in your life. Did anything happen when you prayed with me? Just leave your comments in the box below. I was so shocked when people I prayed for were healed! Yes God still heals people today. 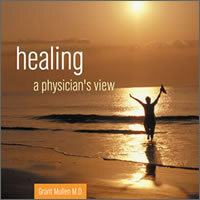 In this DVD Healing, a physician’s view I describe my journey from sceptic to witness of God’s power to heal. You will learn how to pray for others and receive healing for yourself. Click here for more information and a 5 minute preview. Dealing with ongoing depression, I started off my day feeling disconnected, negative and hopeless. Your timely video reminded me of who I am in Christ. I prayed with you and spoke to my mind and body to be healed in Jesus’ name, and immediately felt a weight lift off me. Thanks for the encouragement. You can share the video with others who need a breakthrough. Thank you Dr. Grant this message was so well said and I will share it with my family and friends. There are many mountains and trees that need to be moved in my life now and with so many obstacles standing in my way, it has become quite a challenge. Come to think of it, you are so right, seeing exactly how Jesus spoke to many of those who needed healing in simple words. Nothing fancy, He just to to the illness, but I must add when we pray we need to know that by faith we are believing and trusting Jesus to complete the healing. It might not be right now, but you make an excellent point at the end by letting us agree together and by thanking Jesus for what he has done and continues to do in our lives when we completely trust Him for everything. Living on the Word, eating it, and applying it to our daily lives. Make Jesus the Lord of your life and you have everything! God bless you and Kathy for doing a great work for God’s Kingdom. Nothing fancy, Jesus just spoke to the illness, but I must add when we pray we need to know that by faith we are believing and trusting Jesus to complete the healing. I just love this video posting. Thank you, Dr. Grant for being transparent and such a good teacher. When I started speaking to the mountains, I felt every emotion, especially idiocy. I actually rebuked a storm once because my husband was leaving during a snowstorm for granddaughter’s surgery. I can’t even tell you how I felt–a lot ridiculous, frightened that I was arrogant, and wordless. I think I wondered incessantly if I should lift my hands up like Moses. Then God showed up in the prayer and took it for me. Awesome! The snow stayed at the NY border and husband made it just fine. The more I step out, the more “normal” it is, although it is never without reverential awe and humble prayer. I find that God gives me the “want to” before I step out, especially in healing. I think it’s all about Him through the whole process, anyway. Eventually, I think I have everything to gain and nothing to lose, so just go, like a big heavenly diving board ( plus I love my heavenly Dad and want to help Him if He needs human hands or voice). Thanks again, Dr. Grant. It’s just how wonderfully made each and every one of us is made, knowing Jesus Christ in our saviour and oh how awesome is our God. I just had to share. If you’ve never heard of “Laminin”, here’s your chance to hear from Louie Giglio on the topic. Dr. Grant has probably already seen this but if not be blessed by watching. AIK, I think the Lord had you put up that website just for me..I literally got goosebumps all over my body when I saw that the laminin that holds our body together is in the shape of the Cross..wow..thank you so much for posting that! !Thanks for this video Dr Grant..I couldnt agree more with speaking to our mountains with faith in our hearts to move them out of the way..I think in the book of Proverbs it says life and death are in the power of the tongue, so what we say is extremely important.I learnt this key principle many years ago and I also have spoken to numerous storms over the years and taken authority over them in Jesus’ Name and they left my area..whether it’s a literal storm or not, I know we can take authority in His Name and see those mountains disappear..God bless..
Hi Glory, so thrilled to hear how you were moved by it, like I was. We are created in His image and when I saw this I was like “wow”, this is amazing “Laminin” who would have ever thought how important these proteins were in our creation. thanks Grant, I’m sharing his on fb. Love it. I will keep you posted. You’re welcome Gail. We need to get the word out that speaking to mountains is just being obedient. Let’s increase our expectations of how God is waiting to intervene in our lives. This was so wonderful – I am waiting for my healing from mental illness OCD and horrible anxiety and worrying about my health. Just have to keep believing that an answer is on its way. thank you so very much for the prayer- i got healed! i watched it at 11pm- last thing before going to bed. i prayed along with you- and when i got up from my chair, i didn’t feel the sharp pain anymore!!! lower back muscles are still sore, need to relax, but the pinch-pain is gone… wow! thank you soo much! there’s power in prayer- never forget! Praise the Lord! Fantastic Simone! Thanks for letting us know. Please forward the link to as many people as you know who need healing (along with your testimony). Get the word out! Dr. Grant I prayed this prayer for healing of my emotions, serotonine levels. I believe God will remove this mountain that has haunted me for more than 17 years. I will continue to pray this prayer in the name of Jesus. God Bless you for all your encouragements. Thanks Maryetta. Keep praying with me in the video. You never know when you’re on the edge of a breakthrough. God loves to see faith in action. I just listen to the video a few minutes ago. Yes I believe in miracles, never experience or seen one, God can do anything in His timeing. As you prayed I placed my hand over my knees, Among other issues I felt for right now this is where my worst pain is. Not sure how to put into words the feeling I felt as you prayed. when you finished, I sat there a few minutes, and then got up and walked around immediately, this does not happen, on the norm I stand and wait a few minutes before I can walk. I walked right away, bended my knees up and backward, which I should not be able too and there was not pain. As the day goes on, I will let you know as the day goes on. Wonderful Debbie! Thanks for sharing your testimony with us. Thank you for your motivational videos. I am following my dream and praying that God will open the necessary doors. I prayed for a location in the manner you said to, and God answered my prayer. At the end of my first consultation you prayed for me, I felt a warmth inside, you directed a first step,see my family physician and advised me how to speak to him, you knew I needed a serotonin increase. The next morning(March 16th) after mass I went to his walk in clinic. I softly but boldly stated my case. Without hesitation he reviewed my history and increased the effexor by 75mg, not the 37.5mg. I had spoken several times to him about my depression, he did nothing, my last increase was June 2012, increased to 150mg. from 112.50 mg in October 2011. Already I am feeling more confident, clearer mind, able to solve issues, calmer, sleeping much much better. Why, because you cared enough about me, listened, corresponded with me when you were away, followed up prayed over me and gave me HOPE. Thank you for you words of inspiration. I am stuggling very hard with anxiety and fear. I have started to pray and ask God to help me overcome these crippling conditions in me. I bought your eBook called Emotionally Free. I have been healed, blessed, and restored in so many ways by reading it and being set free by the truths/prayers found in it. I had to read it several times over and each time dealing with different aspects of my life. I have Father God in my life now and I feel HIs strength to love again. I have my “will” reborn/re-made as it was broken as a child… which makes me more confident now and able to lead again… my wow is me poor self-esteem attitude is gone too. I have been set free from bad shame and understand what good shame is now too… I have prayed through many fears and wrong thinking and see God not so much as the jailor of Hell but Him who provides so many graces to keep us out… of that place… I know more than ever I’m not under law but grace…! I have suffer with schizophrenia since 1992 and been on meds for most of it… but it has been a slow recovery… I’m still not 100% mentally… but I would have been on meds 1-2-years sooner had I not had a fundamentalist mindset 22-years ago. My website tells my story… Thanks Grant for your help in putting all you helps and insights learned through your pain and journey… and God’s leading!!! PTL!!! So powerful. Complete healing is available through the resurrection power of Jesus Christ. Thank you Dr. Mullen for bringing me this message. I will walk In this truth everyday. My husband of 26 years no longer wants me as his wife and does not want to fix the marriage. he became abusive toward me and i had to leave to get some of myself intact. I have a broken heart and as he’s just sent me another legal letter, this process of wanting to divide things up so quickly goes against every value i hold dear and believe to be Godly – harmony, togetherness, building each other up, connectivity, etc. As you prayed I had a greater sense of God’s peace. I still am not seeing God’s hand in this situation and don’t know how to get through it and do the things God wants in such an ungodly situation. Just day by day I hope I can stay in Him. Thnak you for this video. Sharon, I’m glad you found the prayer helpful. Keep doing it regularly. It will release the supernatural into the situation. A while ago I prayed the above prayer with you and have noticed since that back problems likely related to a car accident many years ago have eased significantly – lifting ability is much improved. Thanks for sharing this video! Thanks for reporting that Trudy. Keep praying with me on the video and see what happens. Nathan, continue to pray with me every day. You never know what could happen! Thanks for this prayer, I experience God’s Holy power as I listen to it 🙂 Believing for my brain to be chemically balanced. Thank you for sharing your wisdom with us. May God bless you. Thank-you for your continuing advise and comments. I know the Lord is near and it helps for someone to keep reminding us of it. God’s answers are sometimes long on coming but he is Lord and it is in His timing. God praise you for ministry. I went to the doctor last week to renew meds. She checked my blood pressure. Twice, because she was floored!!! It’s now within normal range after being on BP meds for over a year. This is just the latest in all the physical healings the Lord has given me over the last 10 years. He seems to be accelerating healings in these last days. People, if you’re not healed YET, you don’t have long to wait!! Lynda, that’s great news! Thanks for sharing. It’s an encouragement to all of us praying for healing. Dr.Grant I have been praying that the demon of separation and divorce leave my wife and that Gods returns her back to me and my children and our marriage restored . I pray that she will be saved and my family . Also praying for a miracle for my eyes as well . I have been praying to God for over a yr and 4 months now please pray for me and all the brother and sisters who she my post . My wife’s name is Haley . Thank you . I have needed God’s healing touch for my emotional state since my marriage ended over 2 years ago and was left with both physical and emotional damage. I have totally forgiven my husband, however, I have had such a difficult time believing that he did not want to repent and try for our marriage. This is something that only God can do and I need to finally let go and let God. I will now speak to the mountains and am expecting total healing, in particular for my emotions and hurt. Thank you once again Grant. I felt comforted by the prayer I said along with you on the video. I am encouraged from silently praying with you as I placed my hands on the physical area I felt directed to touch; I’m believing & thanking God for you and for his healing hand upon me. I am suffering from anxiety daily. I am on medication that has helped some. I will pray to God and ask to be healed from my anxiety. I will speak to the anxiety and ask it to go away and I will thank God everyday knowing that my healing is on the way. I really need a prayer for me how to let go of someone that was attached to me the ungodly attachment and i can’t seem to let go of him. I’ve got to speak like our Lord taught us ..thanks for reminding us how to do the speaking. Dr. Mullen, I am rejoicing in the Lord and I thank God for you. I have been suffering with depression for more than 1 year. It would seem to go away for a while and then back again. I prayed the healing prayer with you. Nothing happened immediately, but I kept thanking God for healing me as you suggested. Within a week the depression was gone and the extreme tiredness that I’ve been having for over 10 years is going. I believe I will have complete healing in His time. I am now taking the time to praise and thank Him all the time. Thanks again for your commitment to helping others. Thank you very much, will keep you posted. Love this website. Because of this video I am sitting at a gate ready to break fear flying to a funeral. I am taking your words all the way with me thank you I am putting this to practice today!! I prayed with you to reduce my pain and as soon as I woke up the following morning it had worked and I can now walk normally. I now believe in the power of prayer and have thanked God, as I now want to thank you. So Thank you, Grant and bless you. That’s wonderful John!! Thanks for sharing your testimony with us. Prayed with you this morning, and am trusting for healing in several area of my body and mind. Thank you. Thank you for the videos and your prayers. I am reminded again and again by you the importance of prayer. About six years ago or so I purchased all of your DVD’s and one book. I never realized before then how people control one another and how I had become one of those people after living with a husband for 35 years who was a controller until he died. I claim the Lord’s healing for my emotions just as he healed my body when one leg was shorter than the other. Through a believer’s prayer and doubt on my part, my one leg extended to the same length as the other in Sept., 1999. Thanks for the prayer. I agreed with you in spirit and believing to receive the healing/miracle in the mighty and matchless Name of our Lord Jesus. God bless you. I have had severe muscle tension and pain in my neck and down my left side of my back and shoulder. It has become worse since Feb this year. I wake every morning tight, and with knots in many places. I have seen a doctor and have been doing PT for the past 6 weeks and it has not been improving. After placing my hands on my neck and shoulder during this video, I felt tension release. The pain has dropped considerably. I just pushed on one of the knots in my shoulder and the bulge was still there, but the pain is not there. I am looking forward to tomorrow morning in how I will feel! I have never prayed like this before. It has reminded me of James 4:2. That’s great Cassandra. Keep praying and speaking to the mountain! Don’t stop until you are healed. Hi everyone, WOW…. Papa God is so good, I feel so blessed, that he prompted a friend to email this to me…. and of course we all know Gods timing is perfect. I would like to say thank you to Grant, for refreshing my commitment, in speaking to the mountains in my life, some times I get so busy and weighed down and before I know it… I’m in pain and feeling lowly, I have been reminded that this is not what our Loving Father wants for us, his love and healing power is available in abundance, no matter what the time of day or night. I would like to encourage other sisters and brothers. We all are his beloved sons and daughters, and he loves us all equally, and his love speaks to us when he said, I will never leave nor forsake you. I pray, in the mighty name of JESUS , every son and daughter watching this healing video, encounters the instantaneous MIRACULOUS healing of our Lord and Saviour as you speak to your mountain, and know you are worthy to receive, because you are truly Loved. thank you Jesus, we love you, amen. Healing in our marriage after years of hurt/walls. We so honor and respect the hard work you are doing with the LORD in breaking strongholds, vows, hurt, bitterness to help get us to a place of healing and peace. It is almost beyond belief except that Jesus came to raise the dead who were willing. Raise the dead spirit in us and raise the dead marriages living out of the brokenness to LIFE. Thank you for bringing the Schrank family back to life and step into abundant, vibrant life. I first came to know about you when I watched you being interviewed on a Christian show. I ordered youbook. “Why do I feel so down when my faith should lift me up?” The things I learned from that book changed my life!! That was about 17 years ago. I still struggle with anxiety, depression and mood disorder. I relapsed so many times that I now live in a chronic state of this mental illness. As I prayed with you today I gained a sense of hope…hope for improvement in my life. I want to learn more so that I can grow in my faith for healing in my mind. Thank you for persevering the opposition so that I now can learn and grow and be healed. Dr Grant, really encouraged reading all the comments from all the different people and the great testimonies for sure we need to speak too our mountains daily .Blessings Gerri . I had a very sensative pain in my right elbow for months that was there only when something light pressed on it or I leaned on it. I prayed a short prayer about it in the way Grant did. Some time later I realized it was gone! Praise The Lord! In August I fell, hit my head and ended up with a pacemaker after they determined I was in 3rd degree heart block. Now I’m left with a feeling that everything is going wrong. I feel so vulnerable and wonder sometimes if I really shouldn’t be alive. That I’m only alive artificially. When my Mom had her pacemaker put in I teased her that she was the bionic woman. That’s come right back to bite me now. This as you can imagine is extremely unsettling. When I really think about it it brings me closer to tears than anything every has. The blow to head on cement hasn’t helped any either. I’ve felt overwhelmed more than once. Thank you Grant and I wish I had more time for your prayer sessions. I must make more time for them. Your prayer time with me helps me feel better especially during tough times. God Bless you and Kathy and keep up the good work.